Another one of my postage stamp magnets from the Corcoran. 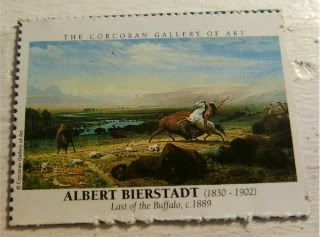 The Last of the Buffalo looks small here, but it's actually something like 5' x 9' - like most of Albert Bierstadt's work, it's pretty huge. It's one of his most important paintings late in his career, and one telling the story of the last days of the buffalo, and the Indians who hunted them. Supposedly, this painting is set at the foot of the Wind River Mountains in Sweetwater County, Wyoming. For a select few, probably just my sisters and me, you'll know Sweetwater territory as the home base of the Young Riders, the supercute boys of early days of the Pony Express...and their housemom, Emma, played by a very young Melissa Leo, before her Oscar-winning, f-bomb dropping speech last night. Here she is, with a very young Josh Brolin, before his own matchy-matchy Oscar-presenting with Javier Bardem, cater-waiter outfit. Heh. If she saw that video she'd probably say the F-word again.